This is a 1st Life / 2nd Life game that is based on paper-based word-finder games. In this game, you try to identify dictionary words within a grid of letters and circle them. 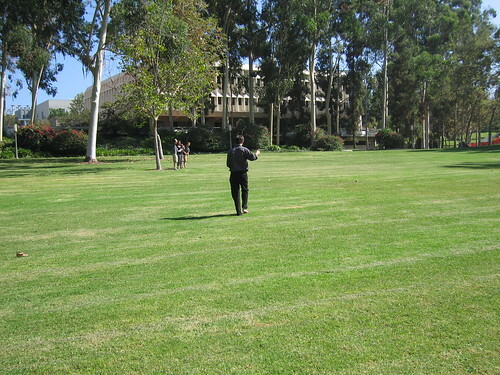 In this variation, the landscape becomes the game grid and you have to walk (or run!) to generate a virtual line that runs through the letters in order to “capture” the word and score points. A GPS is used to help the team identify where the letters are in 1st Life space, and to “capture” the words composed of those letters by recording “track logs” through them. The GPS is able to record where you are in 1st Life, and to create “tracks” of locations, which are essentially connected points that make up lines on the GPS. These track logs can be seen as a way of geospatial drawing — the tracks you make delineate lines which can compose various forms of drawing. In our case, the lines are meant to create lines through the letters that make up the words. (Note that in the more traditional word finder games one circles the letters â€” that would be a bit tricky in this variation, so we’ll just draw an approximate line _through_ the letters. Teams start with a traditional word finder grid. The grid contains words up, down, diagonal and backwards. The challenge is to identify the words and “capture” them by physically tracing their corresponding locations in 1st Life as quickly as possible. 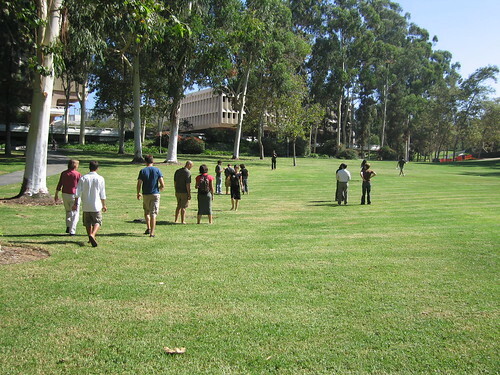 The game takes place in Aldrich Park at UC Irvine, part of the UC Humanities Research Institute’s “Technofutures” Symposium. 1. It may be helpful to identify the corners of the game grid to help you geospatially orient in 1st Life. Translating the game grid on paper to real space can be tricky! 2. Extracting GPS tracks from a Garmin GPS isn’t hard, but it isn’t easy, either. I used GPSBabel, a smart cross-switch between all kinds of geospatial data dialects. On my computer I had to run this as a privileged (root) user in order to access the device. There’s a GUI for GPSBabel, but it was wonky and would say it was done when it hadn’t done a thing. I like the command line, I guess.. 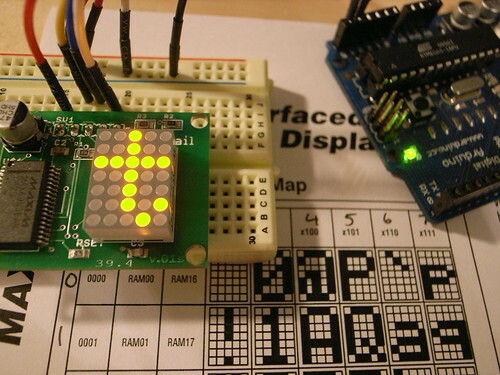 Recently at IMD we had a ball workshopping design and technology for device art using the Arduino. Fun stuff. Below are links to the workshop’s slides and tutorial code. 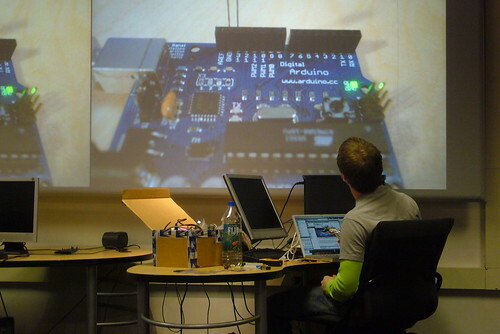 Yesterday at IMD we had a ball workshopping design and technology for device art using the Arduino. Fun stuff. A Second Life avatar produces 1,685 pounds of CO2? And an acre of real estate in Second Life produces 99 tons of CO2? What gives? One of my pet research projects has been to find ways to establish effective, playful bridges between 1st life and 2nd life. What is 1st Life and what is 2nd Life? By 2nd life, I’m not referring to the virtual world run by Linden Labs. For me, “2nd life” is an evocative metaphor that counterpoints the normal, human, physical, material world, which I refer to as 1st life. I’ll grant that the language lacks precision, but I’m relying a bit on my own assumptions, which I think are fairly well-shared, as to what counts as a digital, networked, social environment. 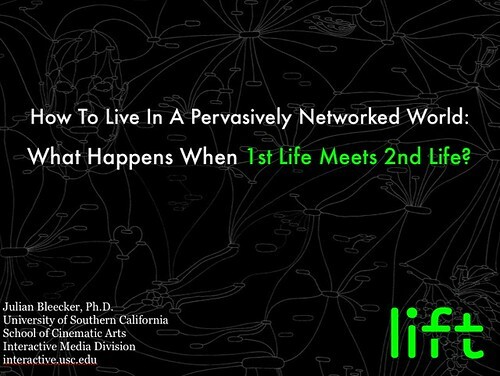 1st life is then the non-networked, non-digital social environment. The presentation â€” titled When 1st Life Meets 2nd Life I gave this week at Lift07 started with a reminder as to the material basis of 2nd life. There is “stuff” that undergirds digital networks — indeed every digital bit owes its life to some sort of material. Atoms compose digital data. There’s that stuff that we’re never really aware of unless we spend time working in the data center facilities where all of the Internets take physical form. 2nd life and its digital networks are made of heavy material — copper cable, steel racks to hold servers, rubber or plastic insulated power cabling, cooling systems, human labor, billions and billions of integrated circuits and the effluvia of the toxic chemicals expelled during their production, shipping and decomposition, etc. Our participation in this materiality probably ends at about the time when we discard the cardboard box and styrofoam packing of the shipping material in which our new computers arrive. But this is more than the William Mitchell bits & atoms thesis. It’s not just the equivalence, but the precise nature of that material â€” what kind of stuff are we talking about? It’s not just the composition of digital bits, but what physical material, in the use of digital bits, of digital networks, of our PC’s, web and game servers, is produced. Perhaps the most unsettling material characteristic of our 2nd lives is considering the resources necessary to maintain them. Whether emailing, googling, blogging, uploading videos, downloading music — everything — this owes a measurable and material debt to first life. When one computes the amount of power — normal 1st life electricity — that is consumed to maintain our 2nd lives it becomes clear what that debt is. Or when one computes how many tons of CO2 emissions result from the production of that electricity, assuming the majority of our power comes from plants that burn something that produces CO2 as a consequence of producing electricity. I started running these numbers after reading a very interesting and thought-provoking discussion on Nicholas Carr’s blog where he computed these figures based on some public figures he found pertaining to Linden Lab’s Second Life environment. One could run the same numbers for any other digitally networked activity, like emailing or web surfing or whatever. What’s particularly appealing about choosing an online world like Second Life as my example is that it’s underlying metaphor is 1st life. 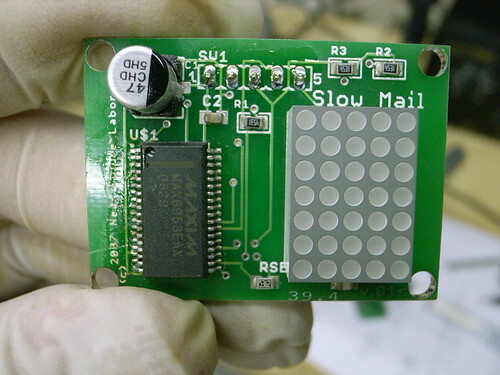 Email would be another good example, as postal mail requires energy that exhausts CO2 in its processing and delivery. But Second Life has more PR these days, so I’ll use that as an example. Second Life itself captures many of the important characteristics of 1st life and uses that to convey a sense of familiarity for the users. There is property in Second Life, waterways, buildings, etc. It’s a 3D virtual world that is largely modeled on commonly held assumptions about what counts as 1st life. What it doesn’t convey to its users is any kind of Second Life representation of the ecological cost of that Second Life world, which would be very cool — Second Life CO2 emissions, for instance, to correspond to equivalent estimates about how much CO2 is emitted in 1st life. I was shocked at the numbers on Carr’s blog, so I computed them myself to check the math. I revised some of his assumptions, so my figures are significantly more conservative than his. (I’d even go so far as to say that my figures are unrealistically low, because a more rigorous analysis would include estimates about the power consumption of the ancillary network devices between the user’s computer and the data center.) I also culled from comments in Carr’s blog post to refine some of the assumptions, especially the remarks from Second Life employees who have direct access to some of the power consumption figures. There are a few additional assumptions I’ve made, mostly pertaining to what I think is a more realistic assumption as to how much power a typical home PC uses, and how often one might actually play Second Life. Carr assumes that a home PC consumes 120 watts, which I think is much too low — I assume 300 watts, based on looking at the technical specifications of a mid-range Dell computer, and I also compute the power consumption of an LCD display. I also don’t assume, as Carr does, that someone playing Second Life is playing 24 hours a day — I assume, averaged over a year, they will play eight hours per day. Some days they won’t play, others they may invest 12 hours. I think 8 hours is a fair assumption. I’ve also used the assumption that 1.35 pounds of CO2 is emitted per kWH of electricity produced. A Linden Labs employee measured the power consumption of their servers and came up with the figure of 175 watts (energy per hour) with the server running at full-tilt. I assume that the servers basically run at full-tilt 24 hours a day, seven days a week, and that servers of this sort make demands on the data center for cooling, power distribution, ancillary resources like lighting, operations center energy costs, keeping the candy and pop machine running in the break room, etc., at an equivalent of 50% of their nominal energy use. So, a 175 watt server actually needs 175+87.5 watts of energy to function in a data center. Second Life is composed of regions that have a correspondence to normal 1st life acres. I’ve learned that there are 16 acres per region, and there are 4 regions per server, so there are a total of 64 Second Life acres per server. That means the power consumption per Second Life acre is 4.10 kWH, or 147,168 kWH per Second Life acre per 1st life year. And that means that 23 pounds of CO2 is produced and exhausted into the 1st life atmosphere per Second Life acre per hour, or 198,677 pounds (90,118 kilos) per Second Life acre per year. Every year, every Avatar in Second Life produces CO2 emissions equivalent to a typical, honking, bloated, arrogant SUV driving 1,293 miles, based on the assumption that this kind of SUV generates 1 lbs of CO2 per mile. If serving this page took the CPU on my modest web server .1 second to serve to you, it probably consumed .004 watt (assuming my clunker consumes 100 watts + 50 watts for overhead)..it works out to about 6 micrograms of CO2, not counting whatever your PC contributed to the production of CO2. Okay, I’m getting carried away, but you get the idea. Why do I blog this?I find this kind of analysis fascinating and revealing. It is the kind of bridge between 1st life and 2nd life I am trying to build, where the semantic link between what goes on in our 2nd life worlds is made plain in its correspondence to 1st life. 2nd life activities are not the clean, sustainable, whole-earth friendly activities the Bay Area, Web 2.0 crew may think they are. Despite the important evolution of human social formations that have arisen, the messiness of the 1st life remains. Maybe there should be a little eco-meter on the dashboard of Second Life, World of Warcraft and, whatever — YouTube and my blog. I’d be interested in computing the same figures for World of Warcraft. I suspect they’re probably equivalent, although I’d probably bump up the average hours of play per WoW character quite a bit. I would need to know the distribution of simultaneous characters per server, or number of servers per instance, as well as some sense as to how much power is consumed by whatever server they may use. It’s about provoking some thinking about the material contingencies of our online activities. I won’t really quibble about the numbers. Someone’s going to want me to adjust something this way or that — the accuracy of the figure will be forever elusive, so I’m not interested in debating that, or tweaking some of the numbers. The point is â€” there is a debt paid for our online lives and we rarely think about it. How can we start to introduce the material aspects of this activity more directly? That is my goal here. Data Centers’ Growing Power Demands: A new report quantifies the electricity consumption of servers, revealing a startling trend. Parenthetically, I’ve been asked why I pluralize Internets isn’t there just one? I guess my speculation is that we are heading toward a kind of Balkanization of digital networks, thanks to the deleterious effects of net neutrality. It wouldn’t surprise me if there were tiers of networks, with levels of privilege offered based on one’s ability to pay for better or faster or thicker bandwidth. This week I’m at the Lift Conference. I went last year and had an amazing time meeting a really novel cast of participants, and not all of them alpha-geeks by any means. There were people from the UN, doctor’s, bankers, homemakers, senior citizen’s advocates, artists, researchers, university professors, architects and on and on. The diversity made for such interesting and engaging conversations, which is something one rarely finds at a technology conference. Lift is also a unique conference in my experience for the openness and transparency of its process. I serve on the advisory board and even with that exposure to the operation you’d think I have special insight, but I really don’t. We publish the expenses directly on the web site. For one, none of the organizers gets paid a salary, at all. Period. It’s all volunteer. No one gets paid. Speakers have their travel expenses covered for and that’s it. No long-dollar honorariums, etc. And that actually keeps the cost of attending within reason of humans. The conference costs 215000CHF to put on and had raised 210000, including registration of attendees. The last 5000 CHF should be made up by the last remaining last-minute registrations, which were raised to 395CHF each to make up for the deficit. Even at that price (around 319USD), this is still the least expensive conference around. This is another Flavonoid variation. I fear there are now becoming more than is reasonable to manage. Each one reflects a different design sensibility and a learn-through-practice approach. 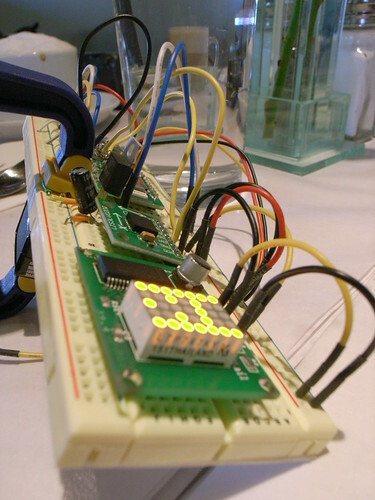 I decided to use the I2C protocol for many of the devices, largely to address the challenge of routing too many signals and in a bid to make the software more manageable. But, I sometimes get ahead of myself. My eagerness to send designs off to be manufactured sometimes has me skip some important considerations. 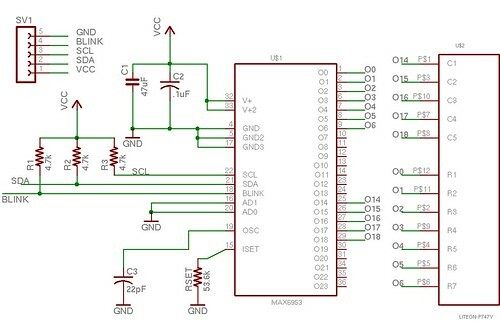 In the case of this design here, I thought I could substitute the clock chip with another, which has the exact same pin-outs, only uses I2C versus SPI. I even prototyped with it. 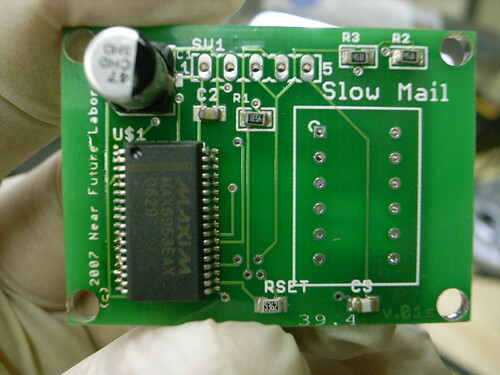 But, it turns out that it’s a 5 volt device, with no real leeway. 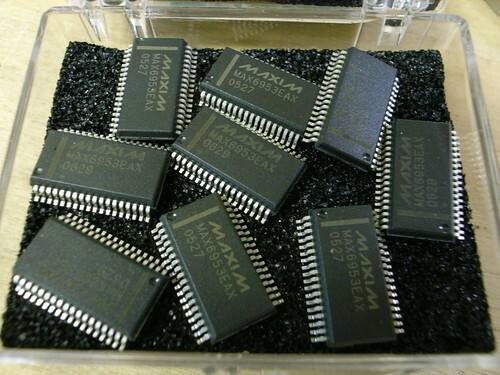 Most of the other chips prefer a low-voltage in the range of 2-3.6 volts. 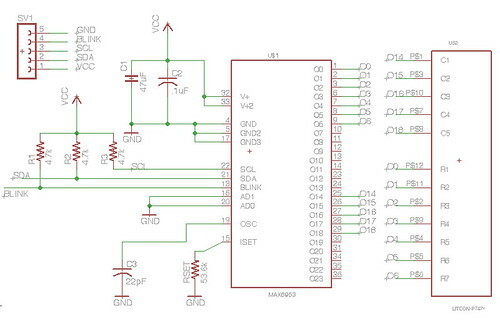 So, basically â€” this real-time clock, the DS1307, is incompatible. Back to the drawing board to find a replacement. 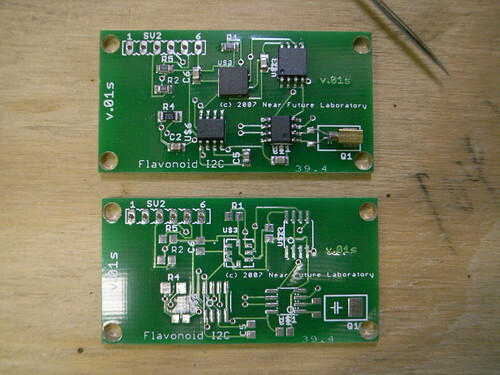 Fortunately, I found a suitable chip, the DS1340, which has the exact same pinouts, is compatible with I2C and is happy as a fed pig at the 3 or 3.3 volts with which I plan to power the board. 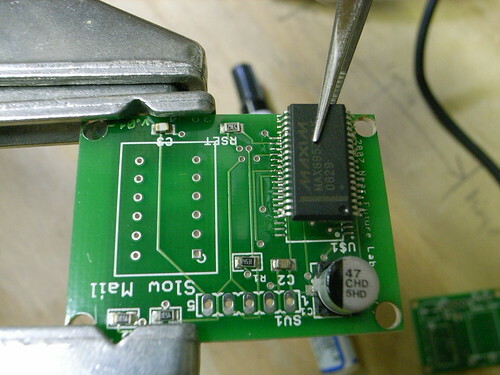 I should be able to hot-air the DS1307 off and replace it with the DS1340. We’ll see how that goes. On this design, I also went with a surface mount crystal for the clock and tried working with a dual-axis accelerometer, but now I’m pretty much definitely of the mind that a tri-axis unit is the way to go. 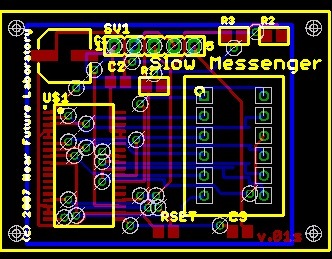 I’ve been working at salvaging the LIS3LV02DQ tri-axis thing that cost me $15 a pop by trying my hand at hot-air rework. 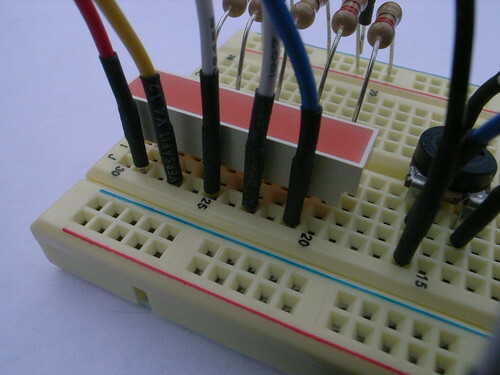 Here I popped the unit off and applied some flux to the thing, and then a warm solder iron. 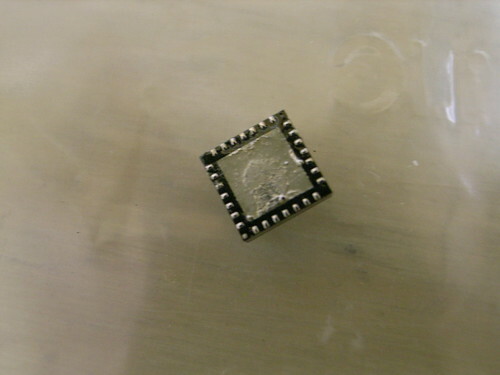 Like magic, it cleaned up and what looked like the perfect amount of solder magically adhered to each and every pin, clean as you like. This is what I should’ve done to begin with. Lesson learned. I reapplied it to the board and it looks like it attached just right. Unfortunately, the landing pad was a bit messed up with missing pads, but those were no-connects, so I might be okay. 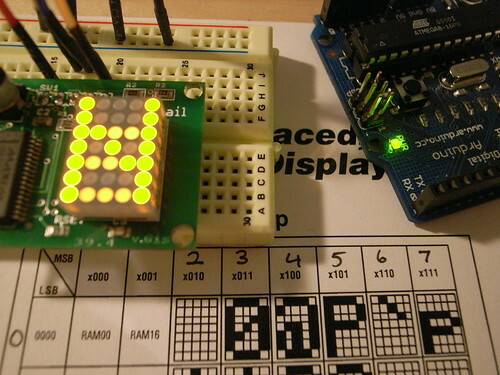 Why do I want a tri-axis accelerometer? Well, my intuition is sort of guiding me here. 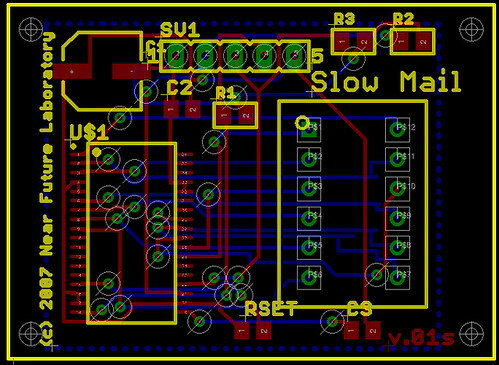 This Durable Affinity design project is not concerned with the typical sort of meanings of precision (split-second, spot-on-accurate measurements of acceleration, etc.) I am curious how ambient precision can be used as a part of the interaction syntax. For instance, what sorts of interaction designs may arise when we take account of ambient movement, or ambient time — how much movement over the last 30 minutes, or has an hour passed or a few hours, and so forth. Why do I blog this? Trying to create implications for my own work and keep track of what’s going on (and why it’s going on) in the Near Future Laboratory!